Finding the perfect translator who can accurately and efficiently translate any document while still upholding the integrity of the original, can be challenging, especially when you are bombarded by so many options on the market. Language Australis is a team of professional and trustworthy language translation specialists who provide the best-quality work and prompt results at competitive prices. Our Arabic translation specialists provide the most accurate translations, every time. Our Arabic translation services are used by government departments, businesses and individuals across Australia. The Arabic translators at Language Australis are accredited at the professional level by the National Accreditation Authority for Translators and Interpreters (NAATI). They are all native speakers into the Arabic language, and are fluent in English, so you can be assured that you are receiving authentic language translations. Why choose our Arabic translators? We carry out translations across a range of diverse professional industries and for individual needs here at Language Australis. Our team of language and translation consultants has a broad and extensive knowledge of such topics as medicine, commerce, technology, finance, marketing, science and the law. With these skills, our translators have the professional knowledge to accurately translate any document, no matter the topic. We understand how important it is for your business to have translations that best represent your work. At Language Australis we assign Arabic translators according to the key content matter of your project and their own expertise in that area. The choice of translator is imperative in ensuring that the Arabic translation will read as well as the original source document. If you need NAATI-certified Arabic translators who have in-depth knowledge and experience in the industry, then Language Australis’ team of highly skilled translators can help you. If you require NAATI-certified Arabic translators and Arabic translation services, contact our team in Melbourne today. We’re located in Malvern East, Victoria, ensuring an easily accessible service for clients across Melbourne. Contact us for advice, a quote or to make an appointment by calling (03) 9571 2227, by emailing lingo@languageaustralis.com.au or by using our simple online contact form. The word ‘Arabic’ means ‘nomad’, the language first being used by nomadic tribes in the Arabian Peninsula deserts. Arabic is the official language of over 20 countries in the Middle East and in Africa. These include Egypt, North Sudan, Iraq, Saudi Arabic and Syria. Arabic is written from right to left though its numbers are written from left to right. Both Hindi and Arabic numerals can be used. There are two versions of Arabic: Modern Arabic and Classical Arabic. Classical Arabic is the official version; it is the language of the Quran and is used in newspapers, books and academic research. Modern Arabic is used in the spoken form. There are more than 300 million Arabic speakers in the world. 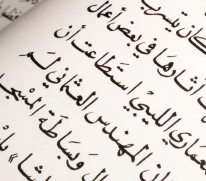 Arabic belongs to the Semitic family of languages and is related to Hebrew and Aramaic. The English language contains many Arabic words beginning with Al, which means ‘the’. These words include ‘alcohol’, ‘algebra’ and ‘alkaline’. Arabic has a rich vocabulary. For instance, there are at least 11 words for ‘love’ according to the various stages of falling in love.